Superior Work That Stretches Your Budget! What's wrong with sidewalk grinding? 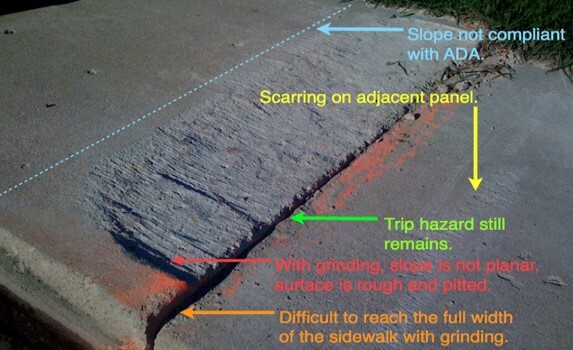 Many organizations spend time and money using grinders, which leave inconsistent results, don’t fully eliminate the hazard, scar up your sidewalk assets, and don’t precisely slope repairs to ADA requirements. Why spend the money twice to do it over, when you can do it right with us the first time? Concrete grinders and scabblers, while commercially available and less expensive than replacement, are usually more costly than our method and they do not achieve consistent, precise results. Many communities have banned the use of grinders, since they are ineffective and they diminish the aesthetics of their neighborhoods. 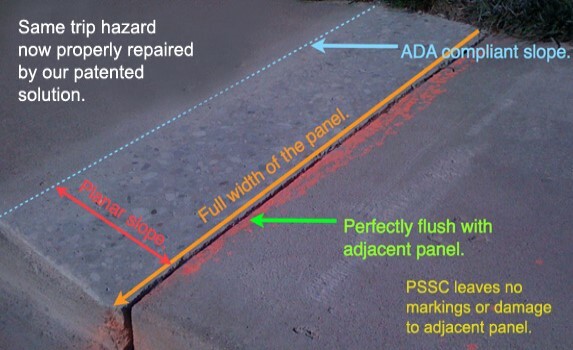 Not only can Precision Sidewalk Safety reach the edges of every sidewalk, precisely sloping the repair to your specification, we can also remove trip hazards from virtually any angle and at any location. The result is a safe, clean-cut walking path provided at a lower cost than any other method. Precision Sidewalk Safety uses OSHA approved equipment, certifies all employees who work directly in trip hazard repair, and has outstanding safety practices for both employees and the public who may be using the walkways we are repairing. We want to make sure the sidewalks are safe for residents and visitors, but we also want to be smart about how we use the City’s tax dollars. Other methods take longer, cost more, and the work really inconveniences users of the walkways. With the Precision method, we saved the City money and the only thing our residents noticed was that the sidewalks looked great and the hazards were removed. Copyright ©2011. Precision Concrete Cutting. All Rights Reserved.